Picturesque canals, renowned museums, a bustling tourism industry—Amsterdam is a European jewel. It holds an impressive number of accolades from city rankings of all kinds. The city boasts its titles as a ranked “alpha world city” by the Globalization and World Cities study group, as the 1987 European “capital of culture,” as the second most livable city by the Economist Intelligence Unit, and as the 12th globally on quality of life by Mercer. 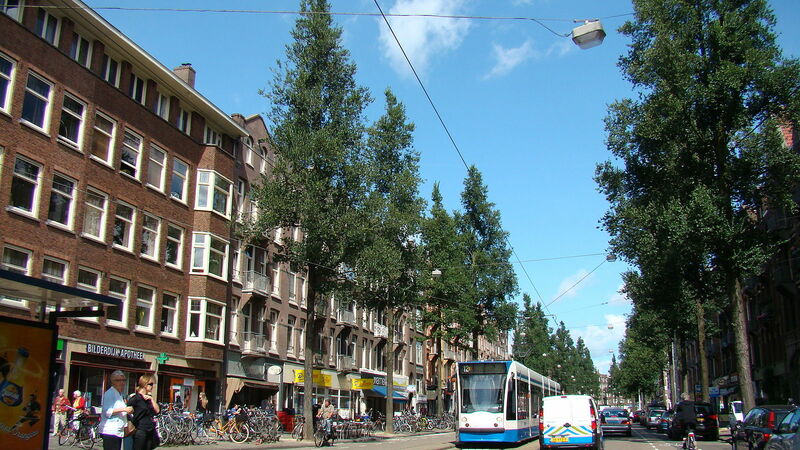 In addition to these honors, Amsterdam holds a strong reputation for its sustainable practices and environmental awareness. Deeply motivated by a host of cultural and historical reasons, many of these initiatives operate strictly at the citizen level, including bicycling. With investment in bike infrastructure, including bike racks and parking garages, originating in the 1970s, Amsterdam owes much of its capacity for cycling as transport to its flat geography, mild climate, and high population density. However, as both population and car use grew in the 70s, loss of life due to cycling on the now-overcrowded roads rose dramatically. The increasing numbers of automobiles, zooming through the narrow streets of the old city, proved extremely dangerous for Dutch cyclers; in just 1971, 3,000 lives were lost, many of them children under 14. Protestors, outraged, declared that Amsterdam needed to “stop the murder of children.” Working in tandem with this “seed of a movement,” the energy crisis of the 70s provided the necessary water for this seed to start growing. The prime minister declared that the Netherlands as a whole needed to lessen its dependence on foreign energy, and enacted policies—such as car-free Sundays, and subsequently a permanently car-free Amsterdam—ushering the city into a new age of transportation. Calls to action such as these demonstrate the potential for environmental issues to link with other, strictly human needs, giving exemplary definition to what we call “sustainability.” Compare this thematically, for example, to the attractiveness of green roofs, which not only offer direct environmental benefits in the form of reduced carbon dioxide emissions, but also human benefits by improving the urban quality of life. Today, the people of the “Venice of the North” own more than one bike apiece, with an estimated 881,000 for the city’s 780,000 people. While on the surface, this widespread reliance on bikes is a positive addition to the city, many somewhat unexpected downsides remain. Thus, due to these simultaneous benefits and costs—both economic and social—the story of Amsterdam and its bikes has much to offer the wider study and philosophy of sustainability. Because of this unique one to greater-than-one ratio between citizens and bikes, in many respects, Amsterdam’s culture of biking has become a mitigated good—something believed to be beneficial, but with embedded negatives at extremes. Though travelling to work by bike is a convenience enjoyed by many of the city’s residents, an unsolved problem emerges when residents are not able to park their bikes safely and quickly. This results in a sea of bikes without racks, thefts, and frustrated Amsterdammers who find it difficult to believe their city truly is bike friendly, despite their first place ranking in cycling friendliness. In fact, bikes put so much stress on the existing infrastructure that the city fishes between 12,000 and 15,000 bikes out of the canals each year. But the canals, and other physical capital in the city, are not the only things placed under stress by more bicycles. The city’s social capital also suffers. Dutch cyclists, holding firm to the belief that instant parking is a right, find themselves struggling to maintain biking civility; said one authority, “If I told Amsterdammers they would have to walk, they would probably need the rest of the day to cool off.” Moreover, this commuter behavior is largely unregulated by Dutch law, as cyclists can legally wear earphones and use mobile devices while cycling. But, there are plans to alleviate these issues. The Dutch Long-term Bicycle Plan, to be enacted between 2012 and 2016, aims to build thousands of new bike racks at stations throughout the city, carefully catered to the needs of the cyclists. The plan also understands that space is ultimately limited and so aims to regulate existing busy locations, with limited parking times and removal of abandoned bikes. Now, while Amsterdam’s struggle with bikes is certainly a challenge for Amsterdam, what does the double-edged sword of bikes in Amsterdam have to offer to our understanding of sustainability? We observe a classic action-reaction relationship between the Dutch and their bikes—dangerous roads in the 70s were followed by a flourishing bike system as biking was encouraged to alleviate stress cars placed on the city’s narrow roads. The rise of biking came with its own set of problems, which in turn resulted in plans to temper unforeseen consequences once the city became oversaturated with bikes. This serves as a cautionary lesson about evaluating costs and benefits when crafting successful city sustainability plans: while on paper, solutions like increased reliance on bikes appear to have plentiful benefits and few costs, unexpected emergent costs could derail an otherwise sustainable program. With evidence to suggest that bikes can not only reduce emissions from cars but are also better adapted to the narrow roads of the city, the government faces a balancing act; they must appropriately balance these benefits with the potential downside of a city infrastructure overrun by cyclists. Clearly, certain costs and benefits are not easy to translate to quantitative outputs, necessitating instead qualitative feedback from the public and consideration of social stresses on the city’s infrastructure. Nonetheless, cycling was and still remains a success in the Dutch city, and the new bike plan provides a good example of the dynamic and flexible accounting needed in sustainable planning to mitigate unanticipated costs. In the comparative analysis between different possible forms of transport, each with its own unique downsides, biking is still winning the fight, providing a more manageable set of externalities.